First of all: happy holidays internet! And second of all, glad to be back. I fell off the wagon there when the winter season of anime started, so that’s put a dent in my plans to keep up with a weekly look at new episodes. I’ve finally caught up with two of my most anticipated series though, so I’ll give a quick run-down of those while I’m here. Feel free to comment with your own thoughts on the season so far! This series has continued to be just as entertaining as the fist episode promised it would be. We have some endearing and interesting characters, a relatively well fleshed-out world, beautiful visuals and some believable (and emotionally gut-wrenching) drama. 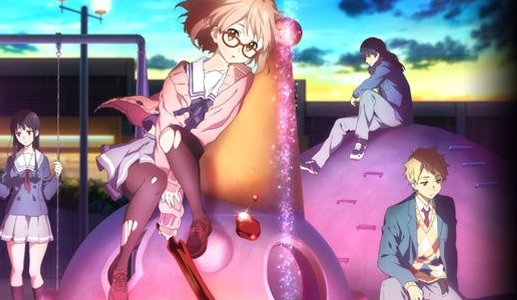 I love a series that can balance out romance, adventure, and drama without letting any one element overwhelm the others, and Beyond the Boundary has done a great job of that so far. Definitely my favorite show of this season. I have seen some reviewers saying that the show is annoyingly silly and doesn’t have that strong of a plot, and I’ll admit that there are some slow episodes. These mostly lend themselves to character development in some way, which I’m all for, even if it’s at the expense of some excitement (though the one “let’s become idols!” episode is definitely there as a fun filler, so how you feel about that is probably up to personal preference.) So take my thumbs-up with a grain of salt. I was extremely hyped for this series, but it’s not quite what I had expected. Not to say that is a bad thing. To start, it’s an amazingly quirky show. The visuals are often rough and very exaggerated, which actually works perfectly with the overall feel of the story and its characters. I definitely had not thought the show would be this lighthearted and fun from the PVs. There’s an theme of establishment versus individual will underlying the whole thing, and it’s really interesting to see how they handle the concept from episode to episode. Also, the characters are fun. Even the villains have something about them that makes them really entertaining, and everyone on the show seems to be just as overblown and outlandish as the visuals. It’s like watching a candy-colored action movie. The thing that surprised me the most though was the sheer amount of fanservice. There was probably some promo material that showed it off that I missed, so the first transformation kind of boggled my mind. 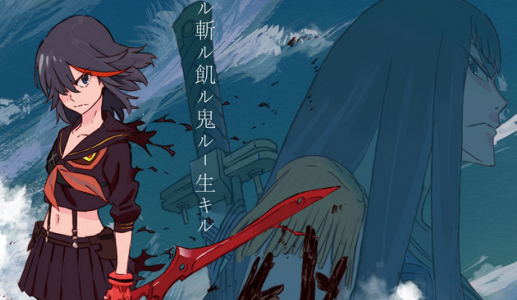 Kill la Kill takes a unique approach to it by not only acknowledging the skimpy uniforms (Ryuko is extremely uncomfortable with her battle gear in the first few episodes, and many characters comment upon it rather than it being ignored outright as the norm), but also by making it relatively important to the plot. Kind of. At least they talk about it and let the characters wearing the outfits have individual opinions on them, which is more than some shows do. There are still squicky things about the show (the main female character is only 17 and is often being leered at/spied on by older men, for one), but overall Kill la Kill brings something unique to the table if nothing else.